It’s that time of year. The time of year when everyone has sided with their favorite sports team and they’re glued to the television every Saturday. Just like athletes choose a play on the field or on the court, men select their most effective grooming products and grooming routines to win the day. 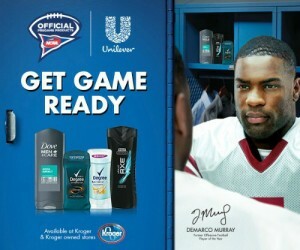 Help him get ready for the game with official pregame products of the NCAA. If your husband is like most men that we all know, he doesn’t like to get too adventurous when it comes to his personal care routine. The medicine cabinet is probably filled with the same 3 products he’s been using since high school and he sees no reason to change now. Sometimes all it takes is a little push in the right direction. Whether it’s getting ready for work, date night, or a trip to grandma’s house for Thanksgiving, Axe, Degree and Dove have what he needs to get ready. In our house, I pull for Florida State and my husband pulls for Georgia Tech and we have our own routine every year when our teams play each other. Before kickoff, we paint each other’s faces, give a kiss and then we promise not to be mad at the end of the game. It’s our tradition and it keeps our house happy. Want to save? Check out the coupons online at Kroger before you head into the store. Load the coupons to your store so you don’t have to carry around coupons. $1 off Dove Men+ Care product (Excluding trial & travel sizes). $1 off Degree product (Excluding trial & travel sizes). $1 off Axe Hair product (Excluding trial & travel sizes). $1 off Axe Deodorant & Body Wash product (Excluding trial & travel sizes). 2 Southern Savers readers are going to win a $50 Kroger gift card. Head to our Facebook page and leave a comment telling me your go-to grooming routine to get #GetGameReady for whatever your day brings. Note: Only the entries on the Facebook post will be eligible. I won’t be choosing winners from this page. This giveaway is sponsored by Lunchbox, but all opinions are 100% my own.